Born in Melbourne, Grounds was educated at Scotch College and then the University of Melbourne, and worked for the architectural firm of Blackett, Forster and Craig. In 1932 he won an award from the Royal Victorian Institute of Architects (RVIA) and left Melbourne to work in England and the United States for two years, gaining exposure to contemporary architectural developments. On his return to Australia, Grounds went into partnership with Geoffrey Mewton, and they introduced the international style to Melbourne. Grounds ended this partnership in 1936 and travelled in England until 1939, when he returned to Australia and worked on Department of Defence buildings during World War II. Grounds practised by himself between 1939 and 1942 and designed a series of houses and flats (including Moonbria, 1940–41) which established his reputation. After the war, Grounds was involved in setting up the curriculum for the School of Architecture at Melbourne University and lectured in design. He resumed his architectural practice and became interested in formal, geometrically based designs. When Grounds, Frederick Romberg and Robin Boyd formed their partnership in 1953 all were well established in Victoria. Each brought substantial work to the practice and the firm became very successful. The Shine Dome of the Australian Academy of Science in Canberra. Grounds' first large commission was for the Australian Academy of Science in Canberra. The construction of its reinforced concrete dome was a considerable technical achievement. Opened in 1959, it won the Meritorious Architecture Award of the Canberra Area Committee of the Royal Australian Institute of Architects (RAIA) and the Sulman Award for Architectural Merit. The Academy building also led to other work in Canberra, initially for the firm and later Grounds himself. 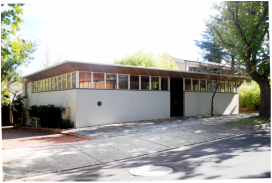 Grounds opened a Canberra office in the Forrest Townhouses (1959), which he partly financed. In 1959 the firm was awarded the commission to design the National Gallery of Victoria and Arts Centre, with Grounds named in the contract as the architect in charge. When Boyd and Romberg were mildly critical of the preliminary geometric designs that Grounds showed them, relations between the partners became strained. In 1962 Grounds left the partnership, taking the commission with him and setting up his own company with Oscar Bayne. Under a building committee chaired by the philanthropist Ken Myer, he devoted the next twenty years of his life to the completion of the Arts Centre. His longest-serving architectural associates throughout this period, which included Monash University's Robert Blackwood Hall, were Alan Nelson, Fritz Suendermann, Lou Gerhardt and Allan Stillman. 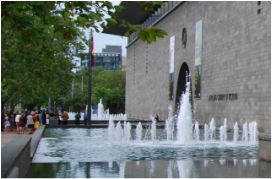 While the Gallery was brought in on time and budget, the complicated Yarra River site for the Concert Hall and Theatre Complex resulted in building delays and criticism. Unlike the fate that befell Jørn Utzon on the Sydney Opera House project, Grounds managed to hold on to his commission from the Victorian Government despite tumult within his company in the late 1970s. Grounds showed Queen Elizabeth II the massive excavations shortly before his death. Much of the theatres' interior designs were completed by John Truscott. Grounds was awarded the RAIA Gold Medal in 1968 and knighted in 1969. In 1969 he was elected a life fellow of the RAIA. One of his last great design successes was Hobart's iconic 18-story octagonal tower that is the main part of the Wrest Point Hotel Casino complex. He died in Melbourne in 1981. In 2010, an original Grounds plan for a library was completed at the Moorilla Estate and entrance for the Museum of Old and New Art in Hobart, Tasmania. Want more of Mr Grounds? Breathtaking design over a sculpted 'moat' Grounds radical 'space-ship just landed' design shook the Canberra establishment into a new way of encountering government building design. Passionately adored by many Melurnians The National Gallery of Victoria is a true Roy Grounds classic piece of architectural design. So popular in fact that when the new architects of the recent re-furbishment wanted to remove the central 'waterfall' feture glass overlooking the front entrance they were met with a barrage of opposition from its admirers. Needless to say the 'waterfall' feature remains in situ today. Designed as his own personal residence, the Hill Street round house is a sublime piece of architectural brilliance. Grounds continued with his passion to create 'square & circles' that work in harmony together. The main-square structure surrounds a central circular courtyard that is viewable from all aspects of the home. Designed in the 1950's after Moonbria the house was a design pre-cursor to the National Gallery of Victoria. There are three separate townhouses located at the rear of the property.